PM #40762529 $5.00 • Vol. 29, No. 27 September 3, 2018 L AW TIMES C O V E R I N G O N T A R I O ' S L E G A L S C E N E • W W W . L A W T I M E S N E W S . C O M Tesla wins court challenge against province Aaron Dantowitz says that the August outcome in Tesla's challenge of Ontario's Ministry of Transportation shows that the courts won't hesitate to intervene in government decision-making under the right circumstances. Photo: Robin Kuniski LAW SCHOOLS Ryerson, Lakehead try new paths P5 MENTAL ILLNESS Duty to accommodate exists P7 FOCUS ON Alternative Dispute Resolution P8 BY AIDAN MACNAB For Law Times A judge in the Ontario Su- perior Court of Justice quashed the Ontario Ministry of Transpor- tation's plan to create and fund a transition program for electric ve- hicle subsidies, after Tesla Motors Canada ULC claimed it had been "demonized" and excluded from the program for "purposes that are outside the legitimate reach of the laws." The decision, Tesla Motors Canada ULC v. Ontario (Min- istry of Transportation), released Aug. 27, shows that if a company is able to meet a high enough threshold of evidence, the court can intervene in government de- cision-making, says Aaron Dan- towitz, a partner at Stockwoods LLP Barristers in Toronto, who was not involved in the case. "While courts are generally reluctant to interfere with govern- ment decision-making, they won't hesitate to do so where warranted, because they take their role as the guardians of the rule of law seri- ously," Dantowitz says. On July 11, the Progressive Conservative government in On- tario announced the end of the province's Electric and Hydrogen Vehicle Incentive Program, which provided rebates of up to $14,000 on purchases of electric cars. The government gave a two- month extension for orders that had already been placed under two conditions: that the cars be registered, plated and delivered on or before July 11 or if a deal- ership had ordered it before that date and it was delivered to a con- sumer, registered and plated, by Sept. 10. The government had sent Tesla a letter saying it did not qualify for this transition program because it was not a "franchised automobile dealership" but an original manu- facturer, wrote Justice Fred Myers in the decision. Tesla Motors Canada ULC is a registered Ontario dealership but not a franchised dealership. Tesla tried to communicate with the Ministry of Transporta- tion since the subsidy program was cancelled, but the govern- ment has not responded. 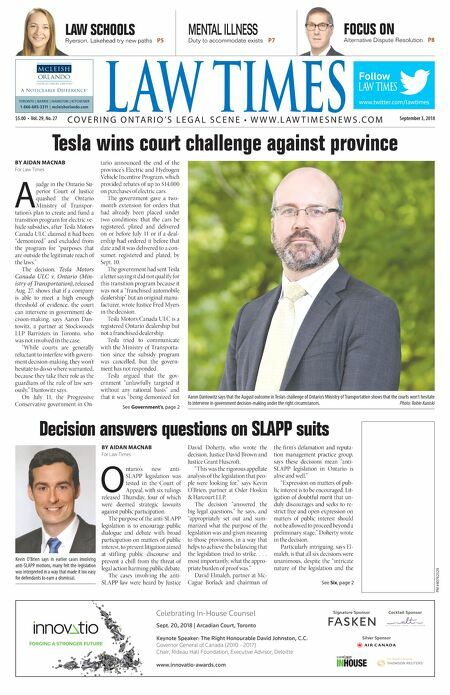 Tesla argued that the gov- ernment "unlawfully targeted it without any rational basis" and that it was "being demonized for See Government's, page 2 Decision answers questions on SLAPP suits BY AIDAN MACNAB For Law Times O ntario's new anti- SLAPP legislation was tested in the Court of Appeal, with six rulings released Thursday, four of which were deemed strategic lawsuits against public participation. The purpose of the anti-SLAPP legislation is to encourage public dialogue and debate with broad participation on matters of public interest, to prevent litigation aimed at stif ling public discourse and prevent a chill from the threat of legal action harming public debate. The cases involving the anti- SLAPP law were heard by Justice David Doherty, who wrote the decision, Justice David Brown and Justice Grant Huscroft. "This was the rigorous appellate analysis of the legislation that peo- ple were looking for," says Kevin O'Brien, partner at Osler Hoskin & Harcourt LLP. The decision "answered the big legal questions," he says, and "appropriately set out and sum- marized what the purpose of the legislation was and given meaning to those provisions, in a way that helps to achieve the balancing that the legislation tried to strike. . . . most importantly, what the appro- priate burden of proof was." David Elmaleh, partner at Mc- Cague Borlack and chairman of the firm's defamation and reputa- tion management practice group, says these decisions mean "anti- SLAPP legislation in Ontario is alive and well." "Expression on matters of pub- lic interest is to be encouraged. Lit- igation of doubtful merit that un- duly discourages and seeks to re- strict free and open expression on matters of public interest should not be allowed to proceed beyond a preliminary stage," Doherty wrote in the decision. Particularly intriguing, says El- maleh, is that all six decisions were unanimous, despite the "intricate nature of the legislation and the See Six, page 2 www.twitter.com/lawtimes Follow TORONTO | BARRIE | HAMILTON | KITCHENER 1-866-685-3311 | mcleishorlando.com cLeish Orlando_LT_Jan_20_14.indd 1 14-01-15 3:15 PM Celebrating In-House Counsel Sept. 20, 2018 | Arcadian Court, Toronto Keynote Speaker: The Right Honourable David Johnston, C.C. Governor General of Canada (2010 - 2017) Chair, Rideau Hall Foundation, Executive Advisor, Deloitte FORGING A STRONGER FUTURE www.innovatio-awards.com Signature Sponsor Cocktail Sponsor Silver Sponsor Untitled-1 1 2018-08-28 8:32 AM Kevin O'Brien says in earlier cases involving anti-SLAPP motions, many felt the legislation was interpreted in a way that made it too easy for defendants to earn a dismissal.